Basic Prosperity Grid #1 ~ For your home or business! Reiki infused! 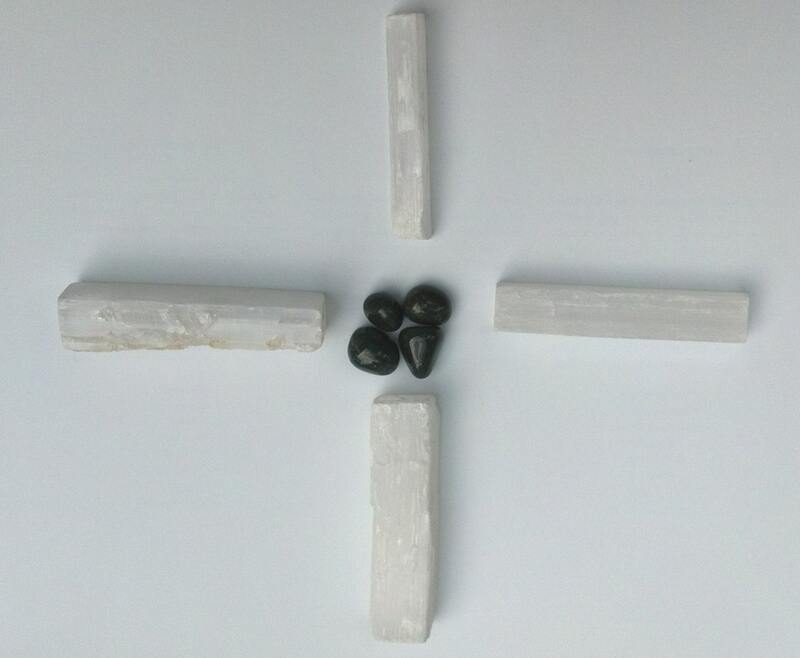 (4) 2~3 inch Selenite sticks combined with (2) small moss agate and (2) small bloodstone. Includes an instruction card. It is recommended to place these in the prosperity corner of your bedroom, home or business, which is the farthest left corner of your home facing in from the front door in western feng shui. These grids are hand-picked and charged by me when the order is placed. After it is ordered, I cleanse & clear it with sage smoke, then I infuse it with Reiki energies that are meant just for you or the one it is gifted to. After, I add the information card and a leaf or two of white sage to the package to keep any lower energies from attaching on it's journey to you. Due to marketplace policy, I am no longer able to provide metaphysical properties for spiritual tools. Please consider purchasing a book on crystals, as this may be the way of things to come for online info in general. I recommend Judy Hall's Crystal Bible series and Melodie's Love is in the Earth. *Please note ~ Crystals are naturally formed and may vary slightly in size, color, and shape. Coupons! Be sure to enter the code before checkout, otherwise it cannot be applied. What are your coupon codes? Will you combine the shipping? Shipping does combine! Just add the items to your shopping cart and it will do the rest. This is a retail shop, however I do have coupons available for up to 25% off and I occasionally have bigger discount sales through social media. Follow me on Twitter and Instagram @KIliamma and Facebook @KiliAmmaLove to stay up to date! Weights are provided in ounces and grams. Once again, if you need it converted into something other than what I have listed, please click the above link and select "Mass" in the top drop down box, then, in the bottom ones, select what you are converting from and to, i.e ounces to grams. I will not hold or reserve and item. With this being a metaphysical shop, if it's meant to be, the item will still be here when you are ready to purchase it. This is such a great kit. I can't wait to use them this weekend!! They are all good sizes too!! Will be buying from you again!! Thank you so much!! Love! Beautiful and exactly like I expected. I'm so excited about this! It's beautiful and the shipping was lightning speed! Kiliamma is a wonderfully, kind, and super helpful person! Definitely be back!